Like something from a Transformers film, the mechanical beast stirred and slowly rose, more than doubling in height as his limbs unfolded and he stood up tall. His metallic face surveyed the crowd he towered over, gathered on the green before him. 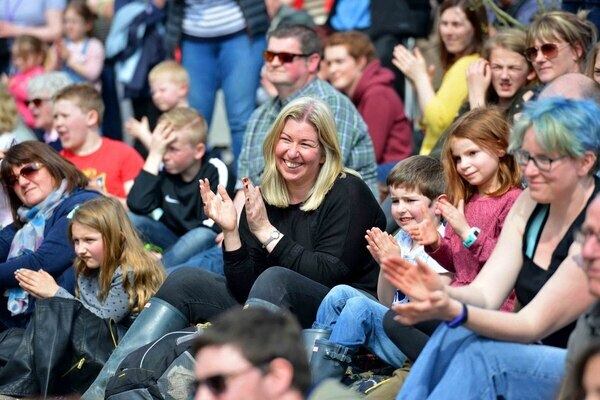 Up to 2,000 people were bathed in sunshine at Blists Hill Victorian Town in Ironbridge to see the spectacle of the Man Engine brought to life at the hands of 10 puppeteers. 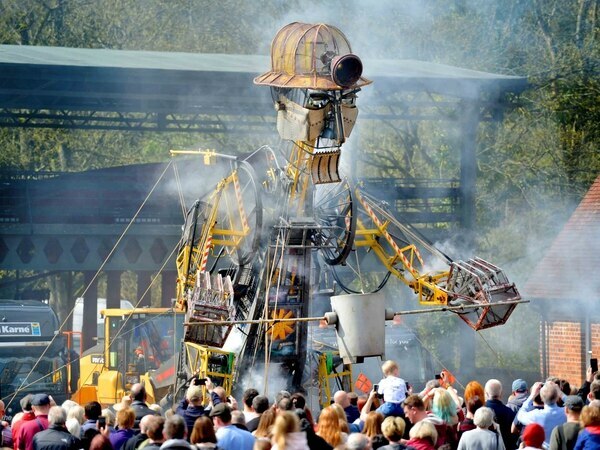 Standing at over 11 metres tall and weighing in at nearly 40 tonnes, the Man Engine is the biggest mechanical puppet ever constructed in the UK. A similar sell-out show in the evening saw the giant figure rise again, fireworks puncturing the night sky as the ceremony came to a close. 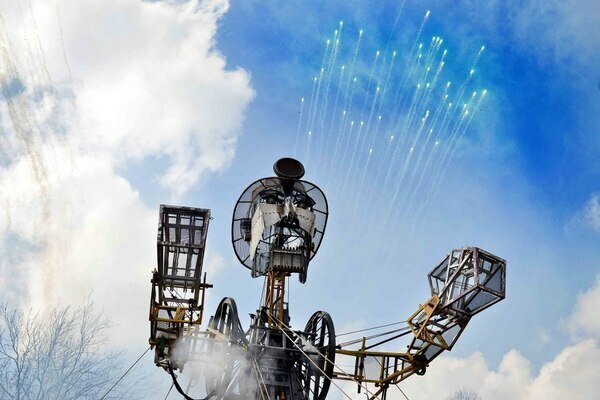 Hailing from Cornwall, the Man Engine is touring iconic industrial sites to celebrate the engineering feats of the past, present and future. 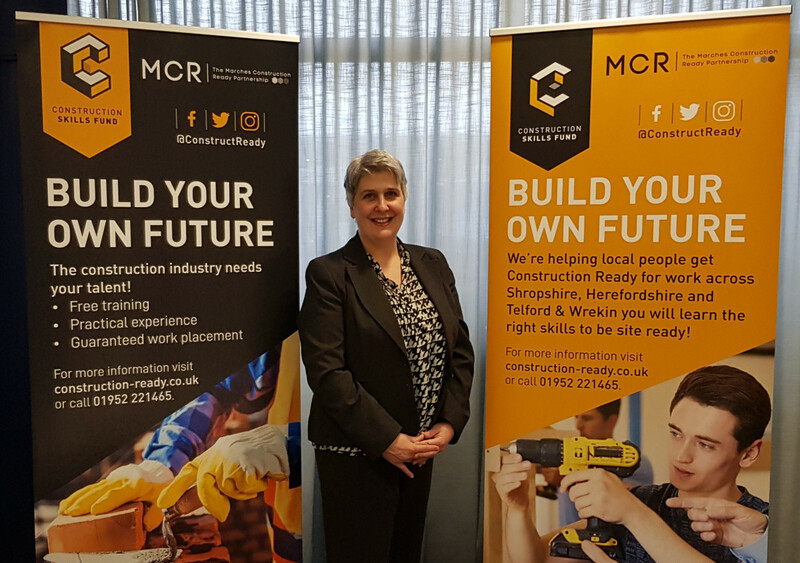 Paul Gossage, marketing director for Ironbridge Gorge Museum Trust, said the project had been years in the making. "People have come from across the whole country to see this, and there is even a delegation here from Belgium," he said. "We have been working with the production company for a couple of years - it has been a huge amount of work for the staff, volunteers and the team behind Man Engine to bring him here. "It's great to finally be able to welcome him, and it's lovely to see so many visitors here. The ceremony involves a lot of audience participation and encouragement, to help wake the sleeping giant to his full height." In a nod to its host venue for the day, the Man Engine was to be woken by a chant in old Shropshire dialect. As the waking ceremony began, the machine, modelled to resemble a miner, was unveiled from beneath a black sheet, crouched in his sleeping position until the crowd's eager cries began to stir him. Will Coleman, CEO of Golden Tree Productions and the brains behind Man Engine, gave an insight into how the project began. It was 2016, and Cornwall Mining World Heritage Site put out an appeal for ideas to help mark its 10th anniversary. Man Engine was born. While the tour sees the Man Engine travel across the country, this visit had a distinctly Shropshire flavour. Mr Coleman spoke of the rich history of Ironbridge "the birthplace of the industrial revolution", the stories of Abraham Darby I, II and III, and solemnly read the names of the three men and six boys who fell to their deaths in the 1864 Madeley mining tragedy. Addressing the crowd from on top of a Land Rover, he said: "We remember the effort and the endeavour, the innovation and the ingenuity. We remember the triumph, as well as the tragedy. We remember those who did not come home." Mr Coleman also read extracts from the journal of Cornish copper miner William Crago, who began work at the age of nine. His stories were illustrated for the captivated audience by a young actor who climbed a 10-metre ladder before descending via an original 'man engine' - the invention that gave Coleman's giant machine its name - which allowed miners to travel up and down the shaft without the use of ladders. As the ceremony came to an end, the young William reached into the machine and produced a cog, which will stay in Ironbridge as a momento of the Man Engine and everything it represents. "This cast-iron trophy, we would like to present to the Ironbridge Gorge Museums Trust, and leave it here as a permanent reminder of the day we all got together and resurrected the Man Engine," said Mr Coleman. "I do not mean to leave it here as a sepia-tinted piece of nostalgia, but a cast-iron promise for the future. We will be taking our Man Engine on his global travels, but a small piece of him will remain here in Ironbridge." Motorists are facing rush hour delays of up to 30 minutes after a crash on..
A Telford pool that was closed for two days thanks to a fault with its mec..
A young girl was taken to hospital after being hit by a car in Telford. 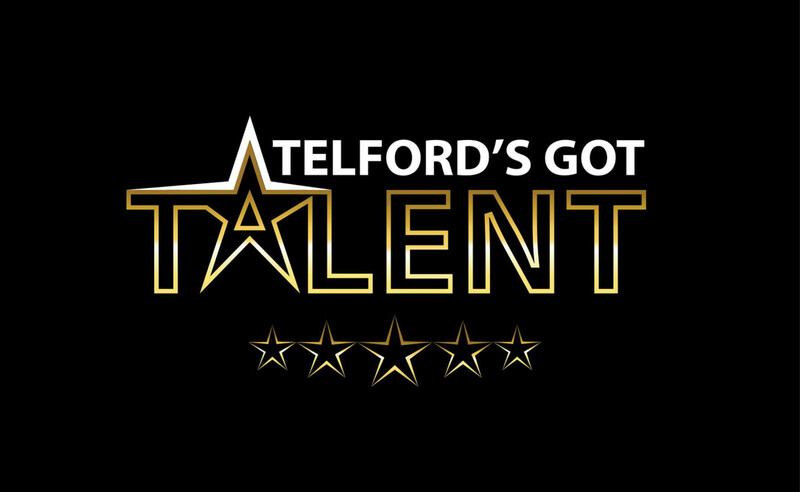 It's the dream of many young men to get into the ring with heavyweight cha..
A cyclist was taken to hospital following a crash outside Telford Central ..